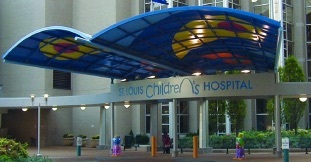 The St. Louis Children’s Hospital is one of the premier children’s hospitals in the United States. It serves not just the children of St. Louis, but children and their families from across the world. The hospital provides a full range of pediatric services to the St. Louis metropolitan area and primary service region covering six states. As the pediatric teaching hospital for Washington University School of Medicine, the hospital offers nationally recognized programs for physician training and research. The hospital employees 3,000 people as well as 800 medical staff members. There are also 1,300 auxiliary members and volunteers on-site. St. Louis Children’s Hospital was undergoing a significant renovation and determined that the original direct steam injection humidifiers that were installed over 30 years ago needed to be replaced. Within 30 years, they had only experienced minor issues due to the age and use of the humidifiers. Most issues were labeled as manifold o-ring leaks or actuator leakage (either seal kits or diaphragms). St. Louis Children’s Hospital consulted with their local Armstrong representative, Mead O’Brien, and looked at using direct steam injection humidifiers with electric actuators versus the atmospheric steam generating humidifier. Due to the maintenance, space concerns, and, most importantly, the controllability, Mead O’Brien suggested direct steam injection humidifiers. When replacing humidifiers during a renovation it is important to analyze the absorption distance. There are many different variables that can affect the absorption distance and, in this case, guidelines and regulations have changed over 30 years since original installation. The amount of outside air brought into the space directly affects the RH levels, and in the healthcare industry, the minimum requirement of fresh air has changed multiple times in the past 30 years. Because of this, some installations required the use of multiple manifolds to shorten the absorption distance. During this first phase of the renovation, thirty-nine (39) new steam humidifiers were installed. Thirty-four more we supplied the following year..
Because of the customer’s relationship with their local Armstrong representative, St. Louis Children’s Hospital received a quality solution that was designed to meet all of their needs and will be supported by Armstrong for many years to come. Click this link to download the PDF version of this steam injection humidifier application note.